The TekTone CM800 Emergency Call System allows emergency calls, security alarms and equipment monitoring from a master annunciator panel. The TekTone CM800 is both a visual and an audio system using both lights and tones to alert staff of an emergency. Healthcare facilities such as hospitals, clinics, nursing homes and assisted living facilities benefit from our TekTone CM800. 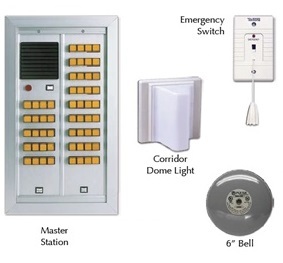 Emergency switches, call cords, call bells and dome lights are available to install in any room needing quick communication with the staff located at the master annunciator panel. The TekTone CM800 Emergency Call System increases the efficiency of healthcare facilities by providing a systematic communication tool between staff and patients. The TekTone CM800 functions either as a standalone system of emergency communication using pull-cords and push-buttons, or it can be operated as an expansion of another system. Depending on a facility’s daily needs, the CM800 Emergency Call System is a flexible and reliable option. The TekTone CM800 Emergency Call System annunciator panels are made of extruded aluminum. The panels can be affixed to any wall or desk for convenience. In order to enhance the safety measures of any facility, four to over 100 illuminated indicator lamps can be aligned with the TekTone CM800 Annunciator Panel. Healthcare facilities depend on our TekTone CM800 for providing security to their patients and residents. For more information regarding the TekTone CM800 Emergency Call System, contact BEC Integrated Solutions.